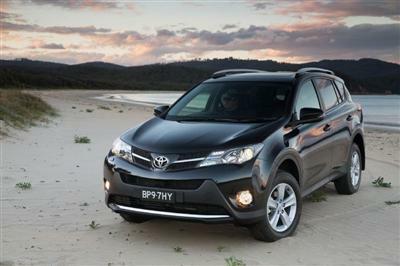 Toyota's new-generation RAV4 range has the choice of three engines and is well specified throughout. Each engine has the choice of two transmissions and there are three equipment grade levels, giving a total of 16 model variants. The three engines are 2.0-litre petrol, 2.5-litre petrol and 2.2-litre turbo-diesel. The 2.0-litre engine can be matched to a six-speed manual or an electronically controlled continuously variable transmission, and has 2WD. The 2.5-litre petrol and the turbo-diesel engine have the choice of six-speed manual or six-speed automatic transmissions, both with AWD. The AWD variants have the added features of an acoustic windscreen and, on automatic models, down-hill assist control (DAC). The 2.0-litre model is offered in two equipment grades, GX and GXL. The 2.5-litre and the turbo-diesel are offered in GX, GXL and Cruiser grades. Entry level GX is highly specified in terms of safety, with seven SRS airbags, ABS with EBD and Brake Assist, VSC, traction control, daytime running lamps, 16-inch brake package and seatbelt indicator for all five seats. The GX-grade exterior equipment includes projector-type headlamps, lift-up tailgate, acoustic sound-deadening windscreen (on AWD models), power-operated and heated exterior mirrors with turn signals, roof rails, rear spoiler and spare wheel (located under the cargo floor). Mechanical specifications include electric power-assisted steering, 60-litre fuel tank and, on AWD models, centre differential lock. Inside, GX grade has the convenience of steering-wheel audio controls, multi-information display and phone controls, 60/40 split-fold rear seat, two front accessory connectors, manual tilt and telescopic steering adjustment, luggage-area hooks, cargo net and luggage-area tonneau cover. It also has six-speaker audio, cruise control, reverse-parking sensors, auto-off headlamps, Eco meter/lamp (on automatic models), power windows with driver's auto up/down, manual air conditioning, and the combination of Hill-start Assist Control and, on automatic AWD models, DAC. Options include 17-inch alloy wheels and a full-size spare wheel. The GXL grade adds 17-inch alloy wheels, privacy glass, reversing camera, dual-zone climate-controlled air conditioning with push-button controls, premium steering wheel and gear-shift knob, sports front seats, console box with sliding lid (on automatic models), manual headlamp levelling and power-retractable exterior mirrors. It has the increased technology of rain-sensing windscreen wipers, auto on/off headlamps, security alarm, display audio with remote AUX and USB jacks and smart entry/smart start. Top-of-the-range Cruiser has advanced safety features and greater differentiation from GXL compared with the superseded model line-up. RAV4 Cruiser has satellite navigation, a power-operated tailgate with memory function, self-levelling HID headlamps with washers, and a tilt-and-slide moonroof. It also has the added safety of blind spot monitor and electro-chromatic interior mirror. Interior features include driver's eight-way power-adjustable seat, driver and front-passenger seat heaters, four-way manually adjustable front passenger's seat, leather-accented seats and premium door trim. Toyota's new entry-level RAV4 2WD has a 2.0-litre dual VVT-i petrol engine, for the best balance of performance, fuel economy and low emissions. 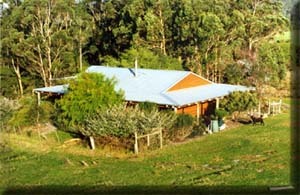 The Toyota 3ZR-FE has been proven in Australia in Corolla Ultima sedan. The 2.0-litre engine has been recalibrated for RAV4, delivering 107kW of power at 6,200 rpm and 187Nm of torque at 3,600 rpm. 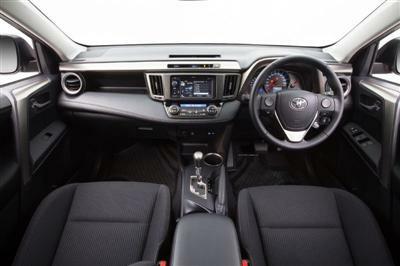 It can be matched to a six-speed manual transmission or RAV4 2WD's exclusive seven-speed MultiDrive Sport CVT. Towing capacity with the 2.0-litre engine is 750kg with an unbraked trailer and 800kg with a braked trailer, provided appropriate equipment is fitted. The 1,987cc 3ZR-FE engine has a bore and stroke of 80.5 x 97.6mm, and a compression ratio of 10.0:1. It returns 7.4 litres/100km and 173g/km with its new seven-speed MultiDrive transmission and 7.7 litres/100km and 179g/km in six-speed manual form (combined cycle rating). 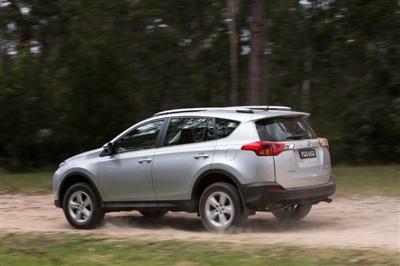 Fourth-generation Toyota RAV4 has a new 2.5-litre dual-VVT-i engine in petrol AWD models. The Toyota 2AR-FE engine offers improved performance, driveability and fuel economy, lower emissions and improved NVH over the single VVT-i 2.4-litre engine it supersedes. It can be matched to a new six-speed manual or an advanced six-speed automatic transmission. The Toyota 2AR-FE engine has an additional 7kW of power and 9Nm of torque compared with the superseded 2.4-litre petrol engine. The 2AR-FE engine has already been proven in Australia in Toyota Camry. 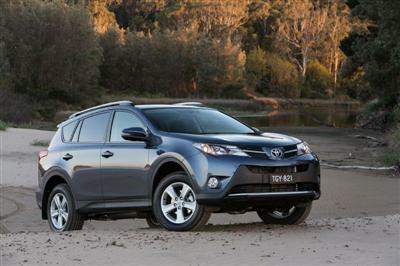 It has been recalibrated for RAV4, delivering 132kW of power at 6,000 rpm and 233Nm of torque at 4,100 rpm. Fuel economy has been improved by 11.5 per cent for the automatic transmission model and 5.5 per cent for the manual transmission model compared with the superseded 2.4-litre petrol engine. ADR 81/02 combined-cycle fuel economy rating for the new 2.5-litre RAV4 is 8.6 litres/100 km for the manual and 8.5 litres/100 km for the automatic model. Towing capacity for the 2.5-litre AWD petrol model is 750kg (unbraked trailer) and 1,500 kg (braked trailer), when the car is equipped with appropriate towing equipment. Toyota uses the acronym VVT-i, with the 'i' standing for the intelligent way the system optimises valve timing across the engine operating range, providing maximum performance and fuel efficiency. The introduction of variable exhaust timing reduces pumping losses and increases the amount of exhaust gas recirculation, for reduced emissions. The system reduces emissions even when the engine is cold (for example, at morning start-up). RAV4's 2.5-litre four-cylinder petrol engine also has a new acoustically controlled induction system, which improves torque in the 'heart' of the driving range - from 2,000 to 4,000 rpm. The intake manifold design is lightweight, quiet and made from a multi-function resin that improves airflow. The design of the new intake port has been optimised through computer-aided engineering. It delivers high power output and improved fuel efficiency by ensuring high air flow and intake tumble flow. Other engine features include low-tension piston rings, an offset crankshaft, three-stage variable output oil pump and roller rocker arms. The use of roller rocker arms, rather than the previous system of valve lifters on a flat surface, results in better fuel economy due to significantly reduced friction between the cams and the sliding parts. The Toyota 2AR-FE engine has bore and stroke dimensions of 90.0 by 98.0mm and a 10.4:1 compression ratio. 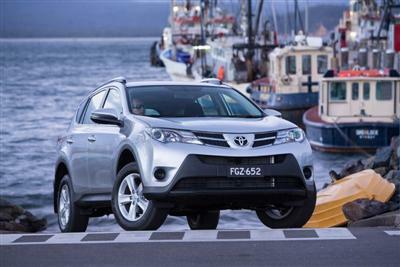 Toyota's new RAV4 is the first RAV4 in Australia with a diesel engine. The fourth-generation RAV4 is available with a 2.2-litre high-pressure injection turbo-diesel engine with 340Nm maximum torque. It has an impressive combination of performance, versatility and economy. The Toyota 2AD-FTV turbo-diesel engine has been proven in vehicles in other markets, including Europe. It can be matched to a six-speed manual or advanced six-speed automatic transmission, both with Dynamic Torque Control AWD. 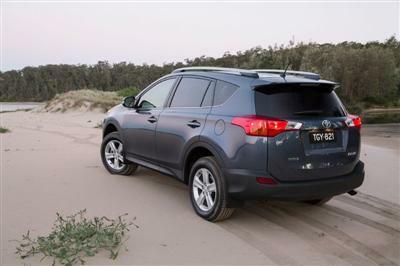 The RAV4 turbo-diesel engine delivers 110kW maximum power at 3,600 rpm and 340Nm peak torque from 2,000 to 2,800 rpm. It offers impressive flexibility, with 200Nm of torque from just over 1,000 rpm and at least 300Nm of torque from 1,700 to 3,500rpm. Combined cycle fuel consumption based on ADR 81/02 is rated at 5.6 litres/100 km with manual transmission and 6.5 litres/100 km with automatic transmission. CO2 emissions are 149g/km and 172g/km respectively. The 2,231cc engine has under-square bore/stroke dimensions of 86.0 by 96.0mm and a 15.7:1 compression ratio. 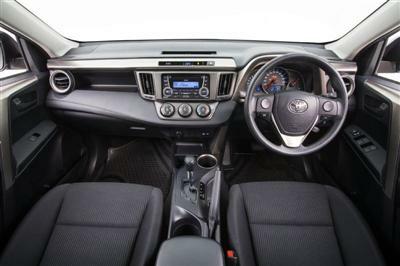 Toyota's RAV4 has an improved driving position, with new seats, a lower driving position, a wider range of steering column adjustment and a wider field of view. There are two new front-seat designs, both offering increased comfort and support while delivering increased rear-seat leg space with a new, thinner seat-back profile. GXL and Cruiser models have the sporty front seat, with larger side bolsters. The front seats in Cruiser grade have seat heaters, with heating pads in the seat cushion, lower back and upper-back areas. Both new front-seat designs are taller, have larger side bolsters and increased cushion length, to expand the contact area and enhance comfort. Support for the lower back and lower leg has been increased. Seat slide length has been extended rearwards by 20mm and the adjustment range of the vertical lifter has been increased by 15mm. The new Toyota RAV4 has a more natural steering column angle. RAV4's rear seat has been redesigned for greater ease of use. The recliner lever has been relocated from the seat-back shoulder to the side of the seat cushion. The rear cup holders are now placed side by side to allow for a larger arm-rest space for the passenger's elbows. Child seat anchorage points have been relocated for easier access. ISOFIX attachment points have been adopted for the rear outboard seats. Three seat coverings are offered, according to model grade: fabric in GX, fabric with stitching in GXL and leather-accented in Cruiser. 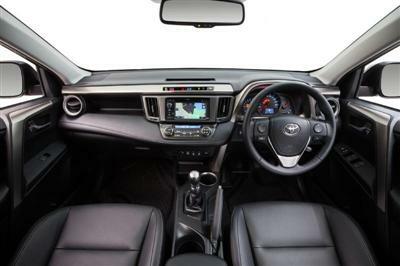 Toyota's new RAV4 was designed for comfort and ease of use, with new features including a top-hinged rear door. The rear door is power-operated on high-grade RAV4 Cruiser. The luggage area has a tonneau cover and a cargo net. All RAV4 models have factory fitted air conditioning, with dual-zone automatic climate control on GXL and Cruiser grades. The air conditioning system includes a pollen filter. RAV4 has six-speaker audio systems throughout, with USB** port and audio mini-jack as standard equipment (NOTE: ** 3.5mm AUX input for portable audio players, USB input for some iPod/USB memory sticks; not all devices will be compatible and functionality will vary depending on the device). 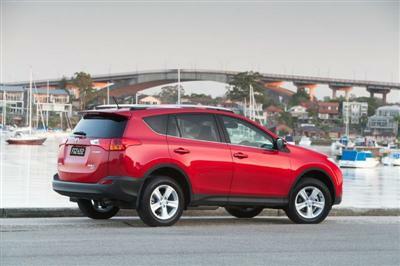 All RAV4 models have keyless door locking; GXL and Cruiser grades have Smart entry/Smart start. All models have an engine immobiliser with rolling code; GXL and Cruiser have an alarm with ultrasonic motion detector. RAV4's NVH (Noise, Vibration and Harshness) package includes a new transmission tunnel silencer. A newly adopted acoustic windscreen, with a layer of insulation film between two layers of glass, is available on AWD models. Special attention has been paid to placement of vibration damping and sound insulation/absorbing materials on the floor, dash panel, roof, doors and rear quarter panel.